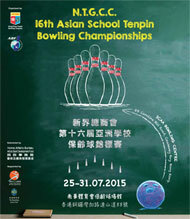 Hong Kong Tenpin Bowling Congress wishes to invite all members of the Asian Bowling Federation to participate in the 16th Asian School Tenpin Bowling Championships, scheduled to take place at the 60 Brunswick Synthetic lanes, South China Athletic Association in Hong Kong from July 25 to 31, 2015. Hong Kong is situated on the southeast coast of China at the mouth of the Pearl River facing the South China Sea. Covering an area of 1,104 square kilometres (425 square miles), it comprises Hong Kong Island, Kowloon and the New Territories, which includes 262 outlying islands. At the core is Victoria Harbour, which separates Hong Kong Island from Kowloon and beyond that, the New Territories that runs up to the boundary with Mainland China. As well as making up the bulk of Hong Kong's land mass, the New Territories also incorporates 262 outlying islands, including Lantau where the airport is located. Under the unique principle of 'One Country, Two Systems', Hong Kong returned to Chinese sovereignty on 1 July 1997 as a Special Administrative Region of the People's Republic of China. This arrangement allows Hong Kong to enjoy a high degree of autonomy, retaining its capitalist system, independent judiciary and rule of law, free trade and freedom of speech. Form A (Intend to Participate) must be submitted on or before 20 April, 2015. The Organizing Chairman and its Committee extends its utmost appreciation to the Asian Bowling Federation for its support, confidence and endorsement of HKTBC as host of this 2015 Championship.